In a recent Politico article, former Health and Human Services Secretary Kathleen Sebelius said she “always flew commercially” on her trips overseas. She then told a group of reporters and editors at Bloomberg that Price’s repeated use of chartered aircraft was “stunning” and that the only time she ever flew in a private jet while in office was to visit a trio of remote Alaskan villages. “Her lone charter flight, she said, was in a propeller plane her staff hired to visit three villages inaccessible by road or commercial aircraft,” Bloomberg reported. But HHS documents that Breitbart News obtained shows that Sebelius actually used charter aircraft on at least five separate trips during her time as secretary of health and human services — including on at least two trips overseas. On June 12, 2009, Sebelius was in Kansas with Vice President Biden. Her staff requested the use of a charter aircraft to fly her from Topeka, Kansas, into Omaha, Nebraska, for three hours and then back to Topeka for a meeting the next morning. Her staff argued there were no commercial flights that would get her to Omaha by the desired arrival time and that portions of other flights were already sold out. The request was approved by the HHS general counsel. Her staff did not include any cost estimate for the travel. 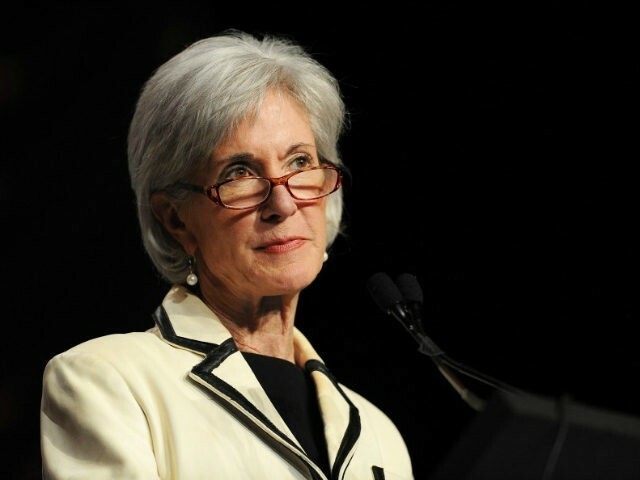 On May 21, 2010, Sebelius’s staff requested a charter aircraft to bring her from La Crosse, Wisconsin, where she would speak at a seniors forum, meet with healthcare executives, and tour a facility, to Mackinac Island, Michigan, for a policy conference the next morning. After attending a VIP breakfast and delivering a speech with then-Rep. John Dingell (D-MI), the charter aircraft would then fly Sebelius, along with Dingell and his wife, to Detroit, Michigan, for another seniors forum. Staff argued there were no commercial flights that would “reasonably” allow her to stick to her schedule and that flying charter would be cheaper, after Dingell’s wife paid for the cost of her flight. Staff said the total cost of the charter flight was $2,921, and it was approved by the HHS general counsel’s office. On July 6, 2011, Sebelius’ staff requested a charter plane to fly roughly 15 minutes from Nairobi, Kenya, to Kisumu, Kenya, to view U.S. government activities in the area, and to fly back at a cost of $11,742.40. Equivalent commercial travel would cost $4,426.86, the request said, but her staff argued that not enough seats were available for all 18 members of Sebelius’s delegation, and the charter flight would save “work time” since flying commercially would take an hour or more. The request was saved in “draft” format for an unknown reason, and thus, there was no approval recorded. Documents are saved in draft format to evade FOIA requests, or for security purposes, but travel can still be taken, approved, and reimbursed, according to a source familiar with travel processes at the HHS. Open-source reporting shows that Sebelius did travel to Kisumu. On August 5, 2011, Sebelius’ staff requested a charter plane for the one trip that the former secretary has publicly admitted to using a charter aircraft for — to tour remote villages in Alaska. The proposed cost of the flight was $21,825.00. HHS general counsel approved the request. On December 5, 2011, Sebelius’s staff requested a charter plane to fly from Mumbai, India, to Belgaum, India, then back to Mumbai. Her staff said the only commercial airline flying to an airport near Belgaum was not believed to be a reliable carrier, due to stories of possible bankruptcy and numerous canceled flights. Her staff also said the cost of the charter travel was “unknown” but estimated it would cost approximately $16,000 if only one charter plane was used for just a portion of the delegation. Staff noted that commercial travel would cost $4,100 for the whole delegation, but argued flying commercially would have caused them to drive an hour to Belgaum and spend at least two nights there. “Belgaum will be the only opportunity during her visit to observe healthcare delivery in a rural, resource poor setting,” it said. The request was also saved in draft format and had no accompanying approval, but open-source pictures show that Sebelius and others made it to Belgaum. Sebelius is not the only former Obama official whose travel record has been misrepresented. Two former HHS aides told Politico that Sebelius’s successor, Sylvia Matthews Burwell, used a military jet for travel to Havana, Cuba, and that her husband accompanied her but reimbursed the government for the cost of the trip. However, the documents obtained by Breitbart News show that Burwell also took a military jet to Berlin, Germany, for a two-day G7 Health ministerial in October 2015, which cost taxpayers $101,240.25. Breitbart News reached out to Kemp again, notifying him of the documents for the aforementioned charter flights and asking if Sebelius recalled those flights but did not receive a response. The false statements from former Obama officials and increased scrutiny over Price’s travel come after Democratic operatives told the New York Times on September 5 they were plotting to take him down amid expectations he would control healthcare reform after two failed attempts in Congress. A group called Protect Our Care told the Times it was planning to launch an aggressive media campaign against Price to damage his credibility amid the administration’s healthcare reform efforts. “The group plans to begin an aggressive media campaign designed to make people question Mr. Price’s statements and actions,” the Times reported. “Putting Tom Price in charge of the healthcare law is no different than putting the Cookie Monster in charge of dessert rationing. He doesn’t want to support the healthcare law. He wants to get rid of it,” he said. Protect Our Care was started by former Obama administration healthcare official Leslie Dach the day after the election. The first Politico article targeting Price ran just weeks after that interview, on September 19, 2017, sourced to current and former HHS staffers and painting Sebelius and Burwell in a flattering light. The travel by corporate-style jet comes at a time when other members of the Trump administration are under fire for travel expenditures, and breaks with the practices of Obama-era secretaries Sylvia Mathews Burwell and Kathleen Sebelius, who flew commercially while in the continental United States. Several former HHS staffers who had close knowledge of the travel plans of former HHS secretaries Burwell and Sebelius could not recall booking a charter flight for short-haul travel. Staff for Burwell and Sebelius said booking even a single charter flight was, in the words of one, a “non-starter” within the department. For example, for last year’s Obamacare enrollment kick-off, HHS staff had planned a multi-city tour for Burwell to urge Americans to sign up for coverage. The effort, which would have required charter aircraft, was ultimately scrapped because of its estimated $60,000 cost. “We were worried about the optics and the cost to taxpayers,” said one former staffer involved in the planning. In her more than five years as a Cabinet secretary, Sebelius says she took a charter flight only to get to remote areas in Alaska, which she and staff said were otherwise inaccessible. Price resigned on September 29 after negative press attention and criticism on both sides of the aisle. Now, attention is shifting to other members of Trump’s Cabinet. After press reports, the Environmental Protection Agency inspector general said it is looking into Administrator Scott Pruitt’s travel, the Treasury inspector general is looking into Secretary Steve Mnunchin’s travel, and the Interior Department inspector general said that department is looking into Secretary Ryan Zinke’s travel.